BMC (reprint) suggests that the printer may be Hans Scheffer, or Johann Scheffler whose name occurs in the Stuttgart tax-lists. Collation: A-P⁸ Q-R⁶: 132 leaves, leaf A1 blank. Colophon (leaf R6r): Expliciunt Epistole Ccilii [sic] Cipriani Episcopi cartaginensis co[n]fessoris et martiris dignissimi. 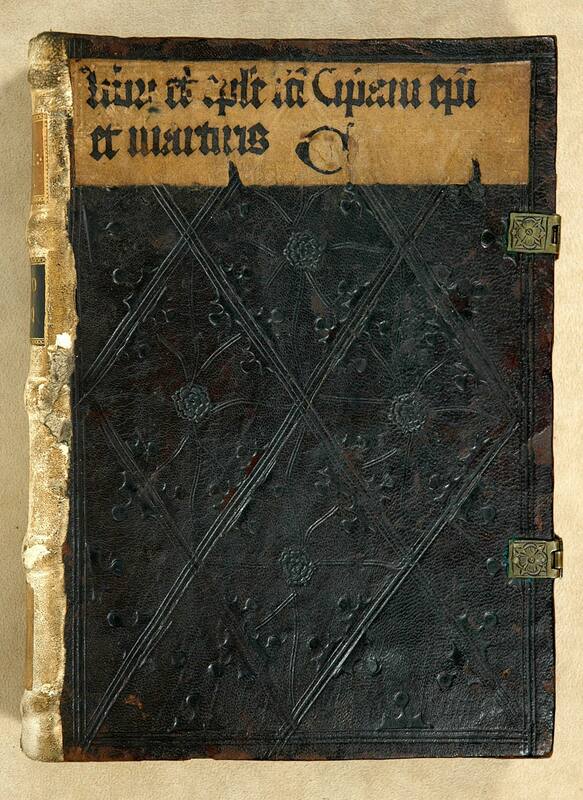 Title from incipit (leaf A2r): Cecilii Cipriani Episcopi cartaginensis et martiris dignissimi Libri et epistole. Contemporary blind-tooled goatskin over beech boards (28 x 20 cm), sewn on 3 supports by the St. Peter Abbey in Salzburg workshop, top and bottom boards are stamped in different patterns; rebacked in white sheepskin. Manuscript waste used to reinforce the hinge and as quire guards. 2 clasps, 1 wanting. Hand decoration: Rubricated, red lombards (some with flourishing), paragraph marks, and capital strokes. Annotations: No notations in text. Salzubrg (Austria), Benedictines, St. Peter, title label with shelf mark C and spine label with shelf mark A.V.2., inscription: Conventus S. Petri Salisburgi, 18th century, and bookplate, 1787 (inside front board); Pierpont Morgan Library, purchased from Lathrop C. Harper, March 1925.